Description: This tree is 40-90' tall at maturity, forming a trunk about 1½-4' across and a globoid to ovoid crown that is often irregularly shaped. On thin rocky soil, dwarf specimens of this tree may develop that are only 15-30' tall, but they are usually too weak to develop acorns. For mature trees, trunk bark is light gray to gray, thin, flaky, and irregularly fissured. 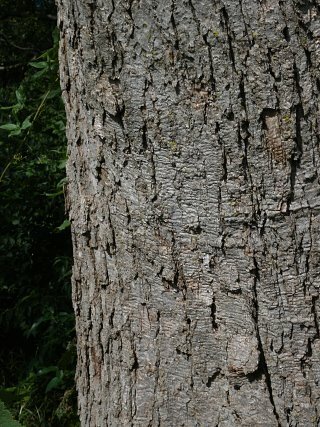 Sometimes trunk bark develops narrow scales, but deep vertical furrows are absent. Branch bark is light gray and more smooth, while twigs are yellowish brown, brown, or reddish brown, and glabrous with scattered white lenticels. Young shoots are light green, glabrous or pubescent, and terete. Alternate leaves occur along the twigs and young shoots. These leaves are 2-7" long and ¾-3½" across; they are oblong-oblanceolate to broadly oblong-oblanceolate or oblong-elliptic to broadly oblong-elliptic in shape. Along their margins, individual leaves are pinnatifid with 7-15 pairs of shallow lobes that are rounded or tooth-like (usually the latter). Tooth-like lobes curve away from the leaf base and their tips are either pointed or blunt. The leaf surface along the margins is either flat or wavy (up and down). The lateral veins of each leaf are nearly parallel to each other; they equal the number of lobes along the margin. The upper surface of mature leaves is dark green and glabrous, while the lower surface is either pale grayish green or white and more or less covered with fine stellate hairs. Immature leaves, in contrast, are yellowish green on both the upper and lower surfaces. The petioles are light green to yellow (often the latter), glabrous, and up to 1½" long. Here is a photo of Leafy Branches. Chinkapin Oak is monoecious, producing separate male (staminate) and female (pistillate) flowers on the same tree. Male flowers are produced in drooping greenish yellow catkins (2-4" long) from twigs of the preceding year. Individual male flowers are less than 1/8" (3 mm.) across, consisting of an irregularly lobed hairy calyx and several stamens. Female flowers are produced individually or in very short spikes (with 2-3 female flowers) from the tips of the current year's twigs. Individual female flowers are about 1/8" (3 mm.) across and reddish green, consisting of a hairy ovoid calyx that surrounds an ovary with 3 stigmata at its apex. The flowers are cross-pollinated by the wind during mid- to late spring. 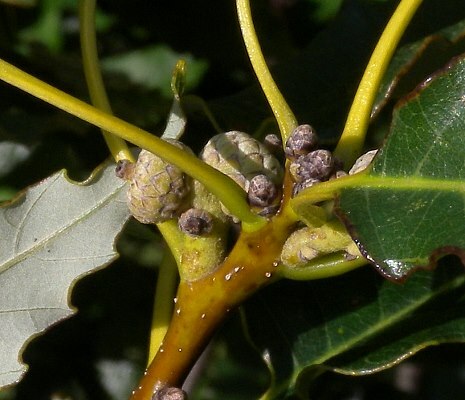 Some female flowers become aborted, while others develop into acorns during the summer. At maturity during the autumn, these acorns are about ¾" long and ovoid in shape. Each mature acorn has a pale gray cap that is slightly tuberculate (bumpy or warty); it extends downward to about one-third the length of the acorn. The nut of a mature acorn is glabrous and brown to black; its interior contains white meat that is mildly sweet and edible. The root system consists of a taproot and spreading lateral roots. During autumn, the deciduous leaves become dull red or brown; a few leaves may persist on a tree during the winter. Cultivation: The preference is full sun, mesic to dry-mesic conditions, and a mildly acidic to alkaline soil containing loam, silt-loam, clay-loam, or glacial till. Seedlings and young saplings have greater tolerance of shade than mature trees. Range & Habitat: The native Chinkapin Oak is occasional throughout Illinois (see Distribution Map). Habitats include mesic to upland woodlands, rocky upland woodlands, thinly wooded bluffs, wooded slopes, savannas, limestone glades, and woodland borders along fields, roads, and parking lots. This tree is often associated with mineral-rich glacial moraines and rocky areas where limestone underlies the soil surface. Faunal Associations: In Illinois and neighboring areas of the Midwest, the caterpillars of several butterflies and skippers eat the foliage of Chinkapin Oak and other oaks (Quercus spp. ): Calycopis cecrops (Red-Banded Hairstreak), Erynnis brizo (Sleepy Duskywing), Erynnis juvenalis (Juvenal's Duskywing), Fixsonia favonius ontario (Northern Hairstreak), Parrhasius m-album (White-M Hairstreak), Satyrium calanus falacer (Banded Hairstreak), and Satyrium liparops strigosum (Striped Hairstreak). Moth caterpillars also eat the foliage of oaks, including such species as Acronicta increta (Southern Oak Dagger Moth), Antherea polyphemus (Polyphemus Moth), Bucculatrix ainsliella (Oak Skeletonizer Moth), Hyphantria cunea (Fall Webworm), and Symmerista canicosta (Red-Humped Oakworm). In contrast, the moth caterpillars Paranthrene asilipennis (Oak Stump Borer Moth) and Paranthrene simulans (Hornet Clearwing) bore through the wood, while the caterpillars of Melissopus latiferreanus (Filbert Worm) and Valentina glandulella (Acorn Moth) feed on the meat of acorns. See the Moth Table for a more complete list of species that feed on oaks. Many aphids, leafhoppers, and treehoppers feed on the tissues and juices of oaks (see Homoptera Table). 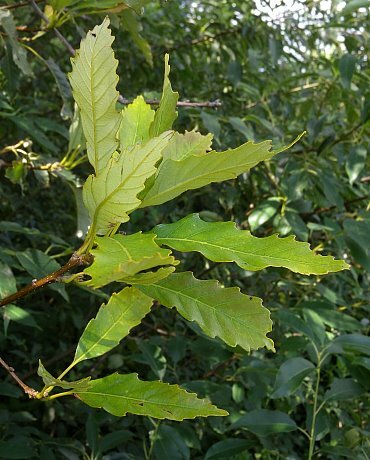 Chinkapin Oak is a preferred host of the leafhopper Eratoneura impar (syn. Erythroneura impar). Other insect feeders include Corythucha arcuata (Oak Lace Bug), the plant bugs Ceratocapsus modestus and Plagiognathus guttulosus, the stink bug Pseudoxenetus regalis, several leaf beetles (Bassareus croceipennis, Lupraea picta, Metachroma spp., Pachybrachis spp., & Paria opacicollis), larvae of the leaf-folding weevils Attelabus bipustulatus and Homoeolabus analis, the larvae of many wood-boring beetles (see Wood-Boring Beetle Table), and the larvae of several gall wasps (Cynipidae). Among vertebrate animals, the palatable acorns of Chinkapin Oak are a source of food to such birds as the Wild Turkey, Ring-Necked Pheasant, Bobwhite Quail, Red-Headed Woodpecker, Crow, Blue Jay, Tufted Titmouse, Carolina Chickadee, and White-Breasted Nuthatch. The acorns are also eaten by such mammals as the Black Bear, Raccoon, Fox Squirrel, Gray Squirrel, Red Squirrel, Southern Flying Squirrel, Eastern Chipmunk, and White-Footed Mouse. White-Tailed Deer browse on the twigs and foliage, particularly of saplings. Older trees of Chinkapin Oak often have cavities that provide habitat for cavity-nesting birds (e.g., woodpeckers, owls, & chickadees) and dens for various mammals (e.g., tree squirrels, bats, & raccoons). Photographic Location: Edge of a wooded area at Weaver Park in Urbana, Illinois. Comments: Across local populations, there is significant variability in the size and width of leaves, and also the hairiness and color of leaf undersides. The scientific name of Chinkapin Oak is sometimes spelled Quercus muehlenbergii. The common name of this tree is sometimes spelled Chinquapin Oak, and it is also referred to as Yellow Chestnut Oak. This tree is one of the 'chestnut oaks' in the white oak group. The common name of this group derives from the fact that their leaves resemble those of Castanea spp. (chestnuts). Among Quercus spp. (oaks) in Illinois, the acorns of Chinkapin Oak are regarded as less bitter and more edible than most. The wood of this tree is hard, heavy, strong, and durable; it has been used to make cabinets, furniture, containers, and rail ties. It is also a source of excellent firewood. In addition to Chinkapin Oak, two other species of chestnut oaks occur in Illinois in the southern section of the state: Quercus prinus (Rock Chestnut Oak) and Quercus michauxii (Swamp Chestnut Oak). Generally, these two species have wider leaves with more rounded lobes than those of Chinkapin Oak, and their acorns are larger in size (1" long or more). However, some overlap in leaf characteristics can occur among these species, and they may hybridize in areas where their ranges overlap. Mature trees of Rock Chestnut Oak have deeply furrowed bark, which is very unlike the thin flaky bark of Chinkapin Oak. 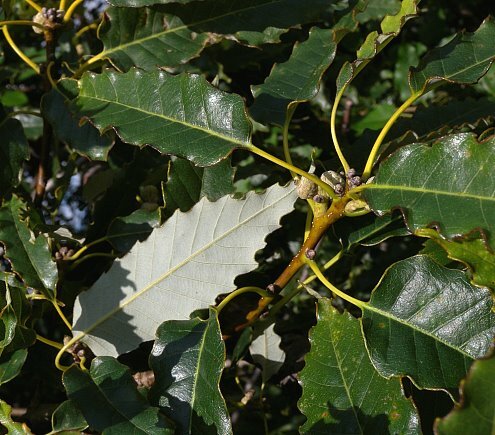 Swamp Chestnut Oak prefers wetter habitats than either Rock Chestnut or Chinkapin Oak. Sometimes, Chinkapin Oak is considered a variety of Quercus prinoides prinoides (Dwarf Chinkapin Oak), or Quercus prinoides acuminata. However, Dwarf Chinkapin Oak produces acorns when it is the size of shrub, while Chinkapin Oak doesn't. The leaves of Dwarf Chinkapin Oak are usually smaller in size and more broad in shape with fewer pairs of lobes (less than 10).